Happy Halloween! Is there any better Halloween treat than a Reese’s Peanut Butter Cup? The correct answer is no, no there is not! It seemed like the appropriate treat to bake for my Halloween party this evening… and there is even a Reese’s baked into the center of the cupcake! I love a good surprise when people bite in. 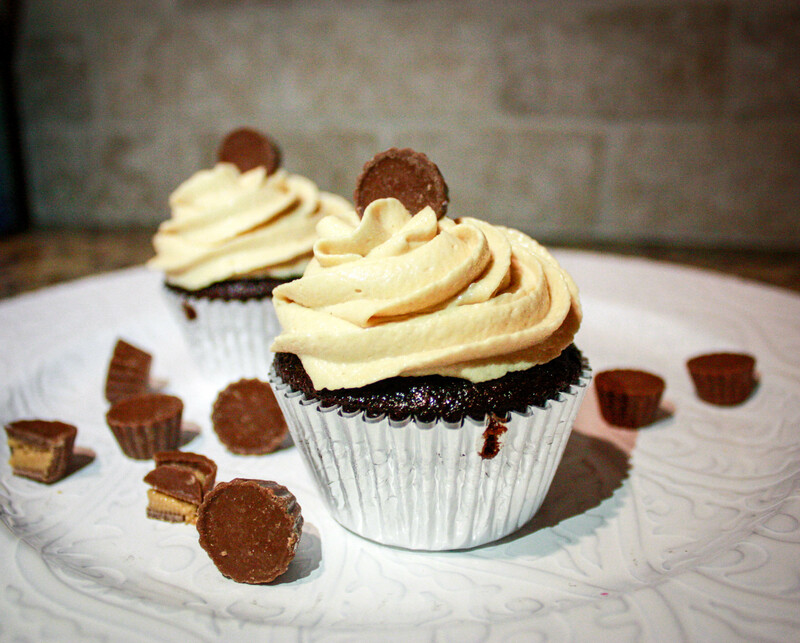 I don’t have any clever anecdotal story for these cupcakes… I just love Peanut Butter and Chocolate. I also had a lot of fun with the Halloween decorations for these cupcakes, I dyed the frosting a bright orange and created little witches hats to top the cupcakes. I made the monster and zombie brains cupcakes in other flavors. Preheat oven to 350º F. Line cupcake pan with liners. In a large mixing bowl, or bowl of an electric mixer, mix together 1c sugar, 3/4c +2T flour, 1/4c + 2T cocoa, 3/4t baking powder, 3/4t baking soda, and 1/2t salt until fully combined. Add in 1 egg, 1/2c milk, 1/4c oil, and 1t vanilla extract. Pour in 1/2c boiling water and beat for 2 minutes. 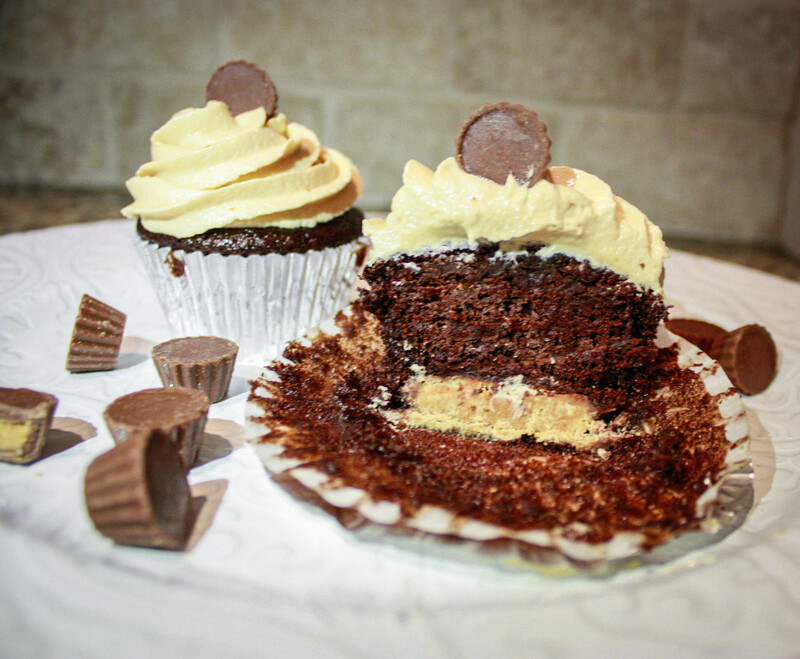 Fill cupcake liners 1/3 full and add a Reese’s snack size cup on top. Then fill to about 2/3 full. Bake for 18 minutes or until toothpick comes out clean. Let cool. Freeze for later if time allows. In a large mixing bowl, or bowl of an electric mixer, beat together 1/2c salted butter and 4oz cream cheese. Add in 1/2t vanilla extract. Once blended, add in 1/2c + 2T peanut butter until fully combined. Slowly add in 2c powdered sugar. Add in 1-2T milk, 1 Tablespoon at a time until you reach the desired consistency. Frost cupcakes, and top with Reese’s Cup or crumbles! yay! i have a whole bag of Reese’s in the pantry! Now i know what to do with them! These cupcake look yummy!! Thanks @Acupcakeforlove! 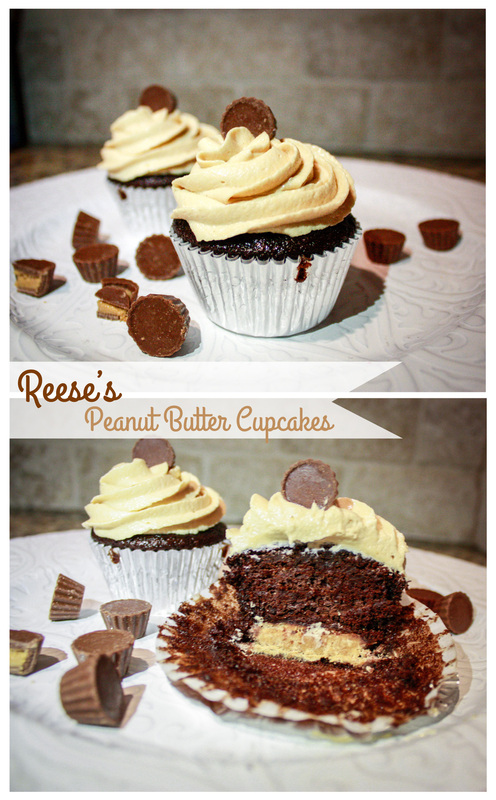 This is definitely a good way to use your Reese’s! Love the ice cream cone hats!